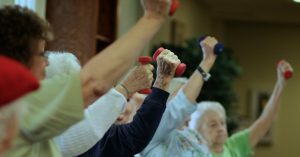 At Rosewood Retirement Home, the health and happiness of Fort Oglethorpe, Georgia seniors is key to our mission. It’s why our services include active recreational and wellness programs, as well as monthly blood pressure, weight and nutritional status checks. We regularly monitor our residents for general health and well-being. Exercise not only reduces the risk of chronic conditions, it also improves blood pressure and decreases the danger of heart disease while also slowing loss of bone density. Regular exercise helps seniors maintain their balance, potentially avoiding falls and injuries. For many people, walking can be a great way to get some exercise. If balance is a concern, seniors can sit while lifting a dumbbell or use a rail, chair or wall for balance while stretching to improve flexibility. Something as simple as taking the stairs instead of riding an elevator improves fitness. Endurance exercises like walking, dancing or swimming, increase breathing and heart rate while strength exercises like lifting objects makes muscles stronger. Flexibility exercises help the body stay limber. Even light exercise helps keep the heart and muscles active. It’s never too late to start. Seniors should check with their physician before beginning any new exercise regimen. Beyond the obvious physical benefits, getting some exercise improves mood and contributes to greater happiness. Talk to us at Rosewood Retirement Home about ways we help keep Fort Oglethorpe, Georgia seniors healthy and active.